Home Blog Which careers are most likely to be automated? New and improved technologies will make jobs redundant, even as they open up new opportunities. This has always been the case, but with recent advances in Machine Learning and Mobile Robotics, changes in the labor market could be particularly extreme in the years to come. In fact, a recent paper suggests that up to 47% of American jobs could be vulnerable to automation within the next couple of decades. 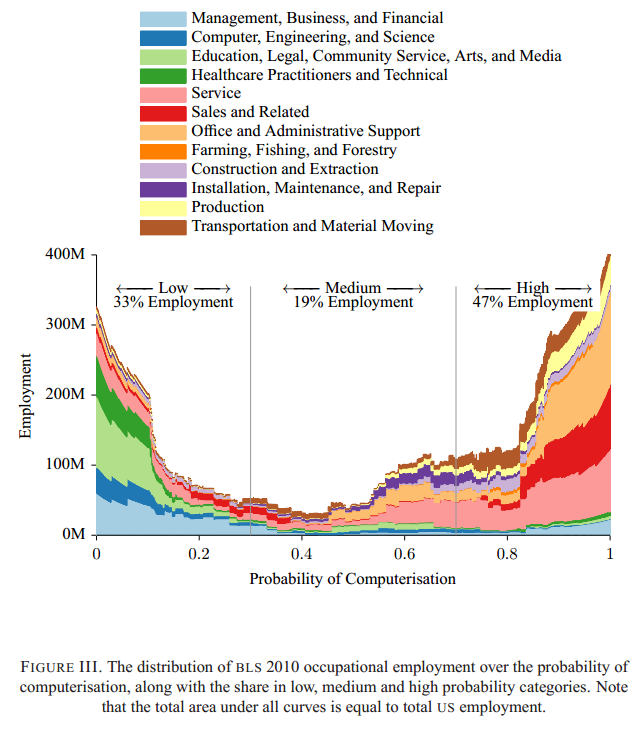 That paper is “The Future of Employment: How Susceptible Are Jobs To Computerisation?”1 by Carl Frey and Michael Osborne of the Future of Humanity Institute (which is affiliated with 80,000 Hours). In the paper, widely discussed in outlets such as The Economist and The Financial Times, Frey and Osborne look at the likely impact of recent advances in order to determine which jobs are likely to be automated. …computerisation is no longer confined to routine manufacturing tasks. The autonomous driverless cars, developed by Google, provide one example of how manual tasks in transport and logistics may soon be automated. We are used to the idea of machines doing most of the work on production lines, and of computers processing staggering numbers of calculations. But these tasks are, from a technology point of view, routine: they require no judgement, or the ability to adapt to changing circumstances. A production line arm will perform the same movements time and time again, and spreadsheets will perform only certain types of action exactly as requested by the user. But computers are becoming proficient at an increasing number of non-routine tasks. How? Through the use of “big data” – increasingly large and complicated datasets. Think of it this way: Human workers have decades’ worth of life experience, which translates into instincts, intuition and common sense. Big data can, to an extent, perform the same function for machines, allowing them to match new situations to patterns in the databanks and respond appropriately. Oncologists at Memorial Sloan-Kettering Cancer Center are, for example, using IBM’s Watson computer to provide chronic care and cancer treatment diagnostics. Knowledge from 600,000 medical evidence reports, 1.5 million patient records and clinical trials, and two million pages of text from medical journals, are used for benchmarking and pattern recognition purposes. This allows the computer to compare each patient’s individual symptoms, genetics, family and medication history, etc., to diagnose and develop a treatment plan with the highest probability of success. Complimenting this increased use of datasets is progress in areas such as sensor technology. Driverless cars are already here, combining use of these cutting-edge sensors with internally stored, three-dimensional maps of road networks. No wonder commercial drivers are likely to become a thing of the past. Robots are still unable to match the depth and breadth of human perception…significant challenges remain for more complex perception tasks, such as identifying objects and their properties in a cluttered field of view. [This] has ramifications for manipulation tasks, and, in particular, the handling of irregular objects, for which robots are yet to reach human levels of aptitude. While robots are perfectly able to move predictable packages in warehouse environments, they struggle in “unstructured” environments like the home, and we have yet to invent anything nearly as tactile and flexible as the human hand. Chefs and plumbers have nothing to fear just yet. For a computer to make a subtle joke, for example, would require a database with a richness of knowledge comparable to that of humans, and methods of benchmarking the algorithm’s subtlety. Coming up with new ideas is likely to stay exclusively within the competence of humans for some time to come, so artists and academics are likely to be safe for a while. While algorithms and robots can now reproduce some aspects of human social interaction, the real-time recognition of natural human emotion remains a challenging problem, and the ability to respond intelligently to such inputs is even more difficult. The famous Turing Test involves a machine attempting to convince a judge that it is human. No machine has so far succeeded, despite this being in one sense the simplest form of social interaction, using text only. Add in complexities such as location and body language, and you have a challenge which is unlikely to solved for a good while yet. People involved in negotiation or persuasion are unlikely to be replaced with any haste. In the first wave, we find that most workers in transportation and logistics occupations, together with the bulk of office and administrative support workers, and labour in production occupations, are likely to be substituted by computer capital…[In addition] a substantial share of employment in services, sales and construction occupations exhibit high probabilities of computerisation. …the comparative advantage of human labour in perception and manipulation tasks could eventually diminish…[leading to t]he gradual computerisation of installation, maintenance, and repair occupations. …most management, business, and finance occupations, which are intensive in generalist tasks requiring social intelligence, are largely confined to the low risk category. The same is true of most occupations in education, healthcare, as well as arts and media jobs. The low susceptibility of engineering and science occupations to computerisation, on the other hand, is largely due to the high degree of creative intelligence they require. The upshot of this is clear: in 20 years time, if current trends in automation continue, the jobs landscape will look extremely different from how it does now. Although how quickly the transitions will take place in different positions is still very much an open question, it seems worth making sure you cultivate the skills which machines find the most difficult to replicate: creative and social intelligence. The least replaceable positions cover a wide spread of professions including chief executives, social workers and healthcare professionals. All of our current top careers fall into the lowest risk category, although some of the lower level jobs in law and medicine are medium risk. We cannot know what new professions will appear as technology changes the world; however we can make some decent guesses as to which jobs are likely to disappear, or at least greatly diminish, and it’s probably worth our while to direct our career intentions elsewhere.